At the intersection of East-West Highway /Ethan Allen Avenue (MD-410) and New Hampshire Avenue (MD-650), the Ethan Allen Gateway is a high use area for pedestrians, buses, and cars. A substantial business area, the Ethan Allen Gateway lacks adequate sidewalks, infrastructure compatible with the Americans with Disabilities Act (ADA), street trees, and pedestrian-oriented lighting. Project construction began in April, 2018 and substantial part of the project is complete. The remaining portion of the project i.e. pavement marking and striping will be completed in Spring, 2019. Looking west Along East-West Highway in the Ethan Allen Gateway Streetscape area. Excess roadway devoted to cars does not accommodate pedestrians, bicyclists, and transit users. 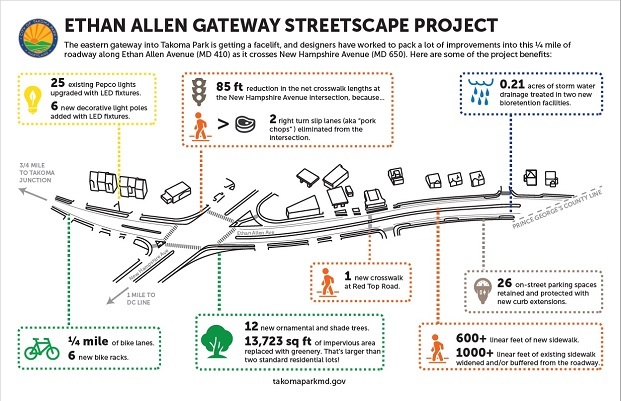 An overview of some of the pedestrian, bicycle, and environmental benefits produced by the Ethan Allen Gateway Streetscape project. Budget: $412,000 for survey, design, and engineering, and an estimated $2 million for construction. Funding Sources: Capital costs for the project were awarded two grants, $1.25 million from the Federal Highway Administration’s Transportation Alternatives Program ( via Maryland State Highway Administration) and $66,000 from the Maryland Department of Transportation’s Bikeways Program. The City of Takoma Park is paying the balance of the capital costs for construction. The construction began in April 2018. The contract was awarded to the lowest bidder J. Villa Construction Inc. Receipt of Qualifications and Bids. Invitation For Bids released for construction of the project. 100% Plans submitted to SHA for final review and approvals. A public Open House was held Wednesday, May 21 for residents and business owners to learn about revised plans for the Ethan Allen Gateway Streetscape. Since the concept was approved in 2012, modifications were made and additional details added on proposed landscaping, sidewalks, lighting, bus stops, and bike lanes. The Regional Transportation Board approved $1.25 million in federal Transportation Alternatives funding for the Ethan Allen Gateway Streetscape project! 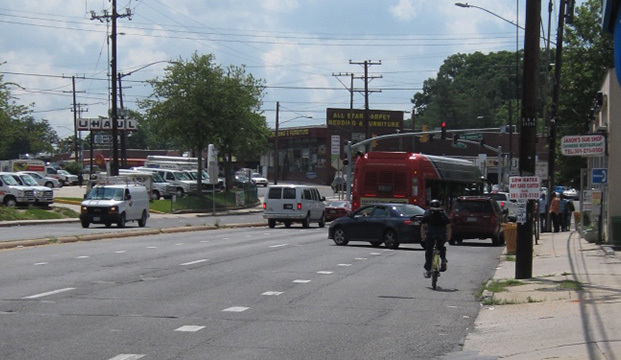 An application for Transportation Alternatives Program funding to construct the Ethan Allen Gateway Streetscape was authorized by Takoma Park City Council Resolution 2013-24. To comply with the application, a revised design of the approved concept was submitted. The concept design for the Ethan Allen Gateway Streetscape was endorsed by Takoma Park City Council Resolution 2012-53. City staff presented the recommendation for the Ethan Allen Gateway Streetscape concept design to City Council. The concept involves removing the islands on the NW and SE corner, removing the eastbound auxiliary lane, adding a sidewalk on the north side of East West Highway, and providing a marked crosswalk at Red Top Road. Council requested supplemental traffic analysis to be conducted for a ‘modified’ Alternative 3 with only one westbound through lane on East-West Highway across New Hampshire Avenue. A Public Open House was held Thursday, June 14 at the Takoma Park Community Center. Three (3) design alternatives were on display, incorporating pedestrian safety enhancements, bicycle lanes, street trees, and stormwater infiltration facilities. Residents and business owners shared their thoughts, preferences, and questions with the project team. Photos from the meeting are posted on the New Ave Facebook. The first meeting for the project was held Wednesday, January 18 at the Takoma Park Community Center Auditorium and attended by over two dozen residents and business owners. Following an introductory presentation of the project, meeting attendees participated in a workshop exercise providing input on streetscape elements for the Ethan Allen Gateway area. See an Overview of the January 18 Workshop, summarizing the process and recorded comments.